Bring on the honey flow – It’s “super” time! July is in full swing, the weather has been spectacularly gorgeous and the bees are blissfully happy. Happy bees mean that the pollen is ready for the gathering, honey is a flowing and the supers are satisfyingly heavy. And, all this means that I smell sweet and have a perennially good-natured smile on my face. Yes, my dears – it’s July. A hive that should look a little "taller" to you. That extra box on top is a honey super. 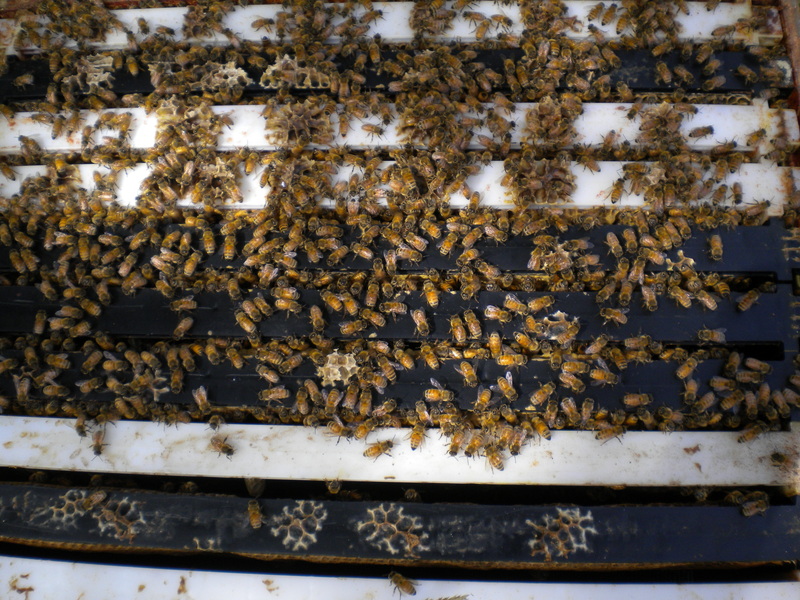 Last time I wrote about the honeybees, I gave you the first lesson in beekeeping: “ten day checks” and what to look for. My weekly-ish checks have been progressing smoothly and the bees are actively flourishing without a hiccup yet. Our weather the past two weeks has been nothing short of incredible. What we lacked in May and June has more than been made up for in July. The worker bees spend their days foraging for pollen and nectar and are outside the hive from sunup to sundown. They tend to their duties rain or shine, but absolutely hit the air at full throttle come gorgeous sunny weather. The entrance to the hive on a delightfully warm afternoon mimics a highway – there is traffic coming and going with bees bringing their bounty back to the hive and leaving for the next load. Here is a worker bee with "pollen baskets" loaded up and ready for a drop-off at the hive. 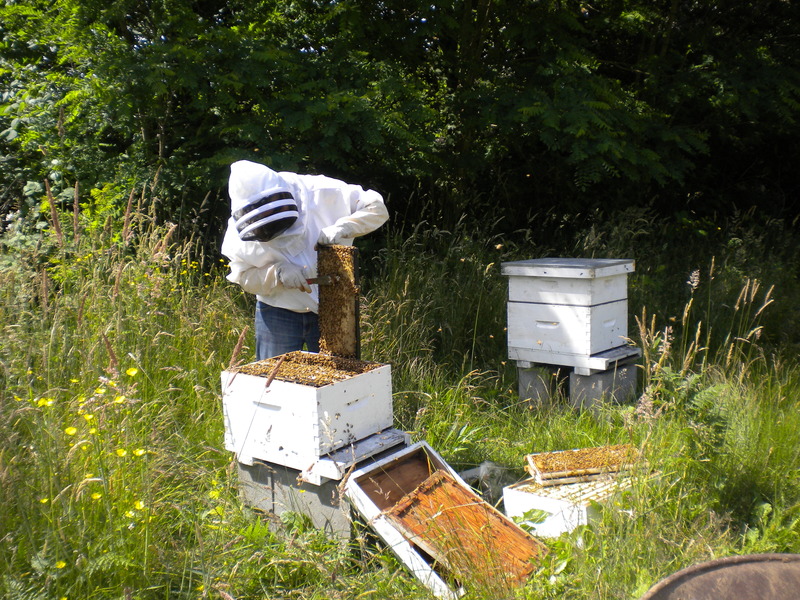 One of my biggest responsibilities as a beekeeper and tender to my girls is to ensure that they always have adequate room to store their goods and do their work. A cramped hive makes for an unruly bunch, the beginnings of a swarm and an unhappy Kate. Frames loaded with honey bees! Here’s the boring information, but it’s so important to help make sense of the whole “honey” thing. And, who doesn’t want to know more about honey, right?! The basic design of the hive has six parts. The dimensions can vary, both in height and width, but the design is relatively the same. Each “box” generally has a total of ten frames and the height is primarily dependent on the purpose of the box. 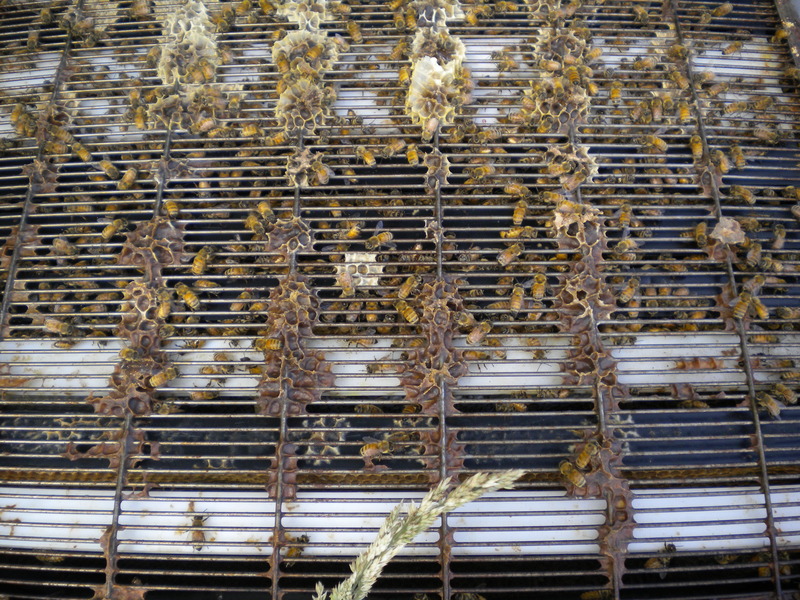 Queen Excluder – a slatted metal screen designed to keep the queen inside the brood box and away from the honey supers. Her abdomen is too large to fit through the slats, but the smaller worker bees are free to move from box to box. Honey Super – these boxes are simply for the storage of honey. They have the same design as the brooding box, but vary in height. A full size 9-5/8” high honey super weighs upwards of 80 pounds when full, while a shallow 6-5/8” honey super weighs a more manageable 50 pounds when full. Inner Cover – the inside cover that has a small entrance at the front for the bees to enter and exit through. 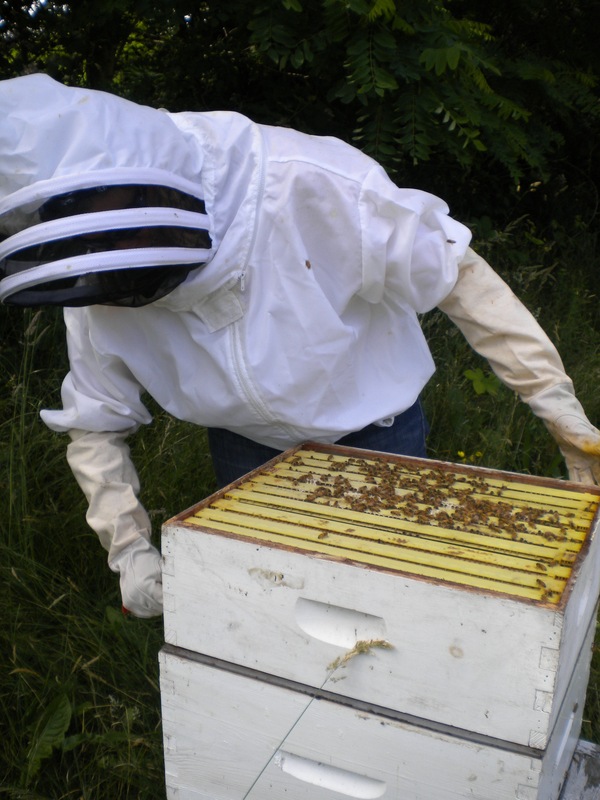 Outer Cover – a weather-proof, telescoping cover that keeps rain and snow out of the hive. A good close-up of the "Queen Excluder"
A frame beginning to be filled with honey. You can see it glistening in some of the cells. After the bees have fanned it with their wings and brought it to the proper humidity, it will change from a runny liquid into the viscous delicacy we all know. The bees then "cap it" and it's ready to pull. When I do an inspection, the bottom board and brood box stay in place. I work inside the brood box and examine what her royal highness is doing, but I don’t remove the box. All the other parts of the hives are removed, cleaned and quickly inspected. The queen’s brooder has a total of ten frames that she can lay her eggs in. That’s it. She isn’t allowed full run of the hive and those frames are her only available space for laying eggs. If she is allowed to run out of room, the bees will prepare to swarm and leave the hive for better grounds – a.k.a “more room”. This is where the honey supers come in. They are the pantry of the hive. 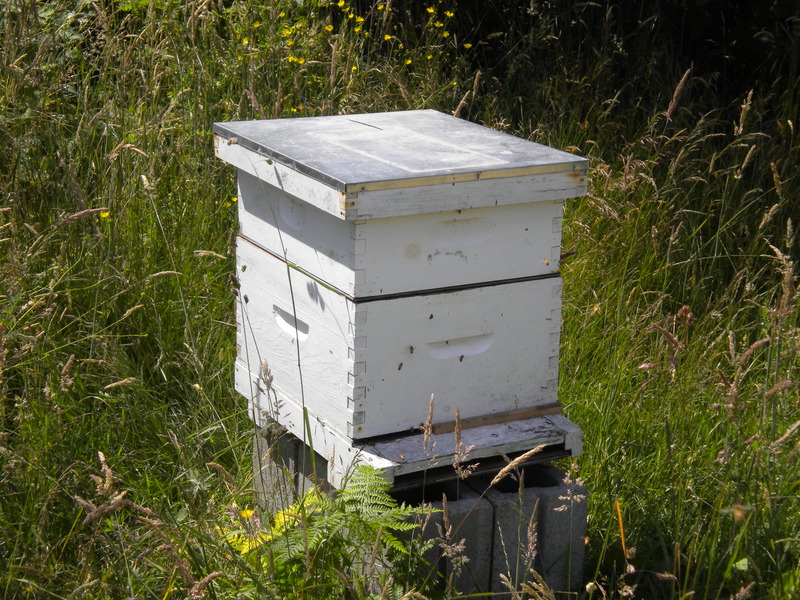 Any stores of pollen and honey can be brought back to the hive and deposited into the frames housed in these extra boxes. My beekeeping duty requires me to monitor that brood box and the happenings of its inhabitants and alter the availability of supers based on the needs of my bees. Getting ready to pull off the honey super so that I can take a look at the brood box. A dismantled hive and all the parts in plain view. Can you find all six?! 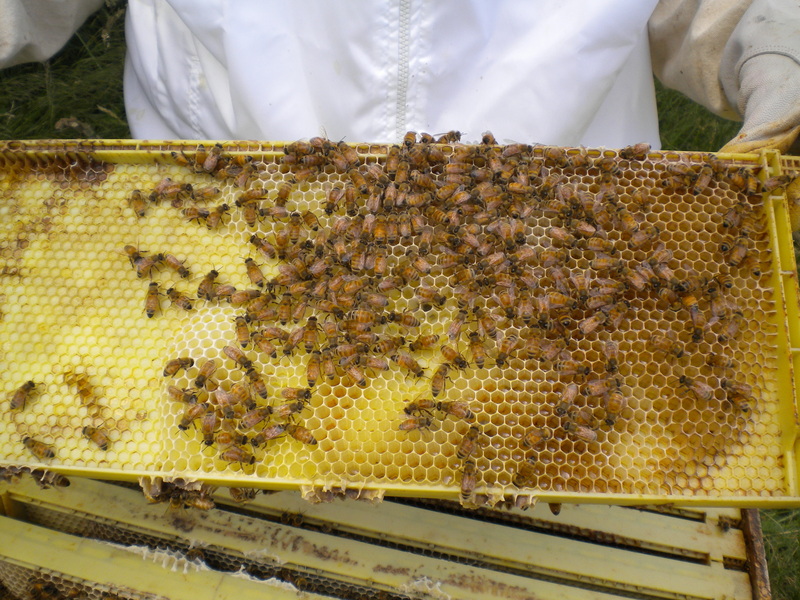 Maybe you are scratching your head thinking… “well, don’t the bees just deposit honey and pollen into the supers, so there should be no need to monitor the brood box because it’s obviously not going to get full…” Yes, that makes sense. But, the bees don’t follow this logic. If their pollen baskets are heavy and the honey stomachs full, they will find the easiest to access, quickest available frame to drop their load in. It doesn’t matter whether it is at the tippy-top of the hive or the bottom of the barrel. So, as the queen is busily laying eggs, she is constantly competing for available space with the workers who are diligently foraging the fields at a maniacal pace. And, beautifully hot weather and nectar sources aplenty makes for VERY busy bees. July is looking good. Real good. There are about a hundred plus pounds of honey in the supers right now. The bees are content. The weather is impeccable. The sweet smell of honey is in the air and I am a happy gal. 2 Responses to Bring on the honey flow – It’s “super” time! This is so interesting to me–I love seeing all the steps involved and how involved you do and don’t need to be! very interesting. but it still scares me. you are brave my friend! Hope some of that honeys travels to California someday soon!